Exclusively Ours! An Allan Robin Design!! Cadmium, Lead & Nickel Free!! New! Bright Silver Tone Plate With Etched "Keep My Husband Safe" On Dual Banded Black Suede Leatherette Bracelet Fastened With Lobster Clasp! 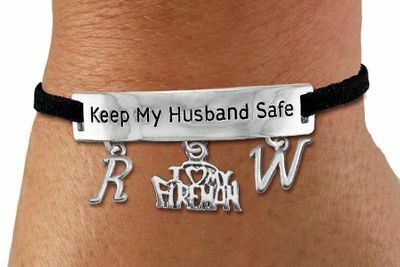 Comes With "I Love My Fireman" Charm And Initials Included In The Price! Center Charm Measures: 1 1/4"w x 1 1/4"h.
To Order Additional Bracelets With Different Initials Please Call Your Order In Toll Free At 1-800-961-2463, Or Add To Cart And Then Click On; "Keep Shopping" And Order The Additional Bracelets. Quantity Pricing WILL Keep Up In The Shopping Cart As You Add More.